My booklet became a chapter in another book. I thought that my e-book Every Bead Has a Story was going to be the end, but apparently not. You might remember that earlier this year, I wrote a little e-booklet called Three Bezels Plus a Bonus. Well, although I didn't know it at first, that e-booklet has turned out to be chapter one of a new book, Some Assembly Required. 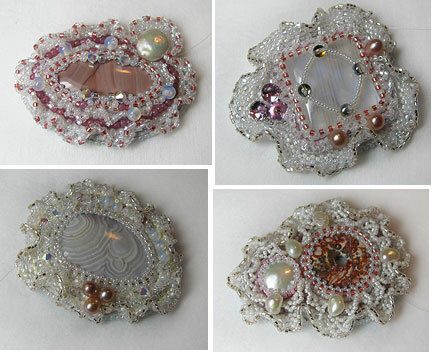 While the first chapter dealt with adding Swarovski crystals to your bead embroidery, Chapter Two, Peyote & RAW Bezels Plus Peyote Texture turns to free form cabochons. Combining two different stitches allows you to stitch these odd-shaped treasures right into your mixed media bead embroidery projects with ease and style. Three different styles, in fact! 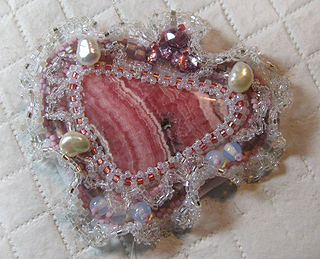 In addition, I'll show you how to extend the peyote stitch into ruffles which will add amazing texture to your beaded pieces.